Factor Irrigation will work harder for you. A family–run business that understands what you want because we're homeowners too! Factor Irrigation started in 1991 as Affordable Sprinklers, and became Factor Irrigation Inc. in 2002. Charlie Factor is the president and founder of the company. For 25 years, he has been installing and maintaining irrigation systems all over Rhode Island and the surrounding area. The focus has always been on sprinkler systems that were easy to maintenance, with outdoor access, and installing systems that followed the basic industry installation rules in order to save water. Many of the customers we served in the 1990's are still our customers today, and systems we installed are still running smoothly, just as they did then. We still maintain many of these systems to this day, and after 15+ years some still have the same original sprinklers and valves, and in the same locations. It is really amazing how the proper installation by the right installer will last a long time and make the most of your investment. Charlie holds two U.S. patents, and has many new inventions pending. Many of his inventions have improved irrigation installation — ideas for filtering dirty well water, ideas for faster better installation, ideas for maintenance access to improve service, and most recently a new injection system for Cedar Oil called AutoBuggTM. This all natural, non toxic, pest control is applied through the sprinklers automatically every week — it smells great, and drives out mosquitoes, fleas and ticks at half the price of what traditional lawn pest control companies charge. No toxic chemicals, E.P.A. exempt, and it smells great. Cedar Oil is the hottest thing for poison free pest control all over the Southern U.S.
Charlie has been married over thirty years to Wanda Factor and are proud parents of four children. Their children all worked their way through college and have always worked for the company. Wanda works at The American Athletic Conference in Providence (formally known as The Big East). Charlie designs lawn irrigation systems, does sales and service, and starts with the crew each morning on the job to layout your system to assure you get exactly what we promised. General Manager, Josh Factor: Josh is married with three boys. He received a degree from Rhode Island College in philosophy, and political science. Josh is really focused on managing a well-run company. He has a quiet patience that helps those around him work together. He has done every aspect of the irrigation business since he was in High School, plumbing, electrical, valve work, and system design. Josh has the ability to do all the trades involved, but his focus has always been customer service, and company management. He feels a great customer relationship is just as important as a great system. Business Consultant, Casey Factor: Casey is married with three kids — a son and daughter, with one more on the way. He earned a masters degree from Bryant University in finance. Casey currently serves as senior manager of finance for a major communications company. Like his siblings, he also worked his way through school while working in the family business. His financial experience makes him a valuable adviser, and he is working part time to help his brothers run the company. Installation Manager, Benjamin Factor: Ben holds dual degrees from the University of Rhode Island — a Bachelor of Science in Environmental Horticulture and Turfgrass Management and a Bachelor of the Arts in Communications. He also has worked in irrigation for many years, like his brothers. Ben also had one year working golf course maintenance. He has installed a lot of systems over the years, and chose to study turf in school to enhance his skills managing this installation crew. Office Manager & Senior Administrative Assistant, Alexandra Factor: Allie attended two years at Community College of Rhode Island, and has been running the office for the family since 2008 (she worked there previously as a trainee since 2004). Like her brothers, she worked her way through school while learning the trade, so she has years of customer service and sprinkler knowledge. Factor Irrigation has a power house of skilled people working for you. When you hire us, you will get the best! We have the newest equipment and techniques to get the job done right, quickly, and cost effectively. We can do a premium system with all the bells and whistles, often for the same price as many "discount" systems. Our Class A coverage allows your sprinkler system to keep the grass green with less water. And, we also offer the exclusive AutoBuggTM mosquito control system, which injects all natural cedar oil evenly, all summer long, to stop bugs from eating you and your family. Only Factor Irrigation installs the AutoBuggTM system in the Northeast — a system that works year after year without extra maintenance. 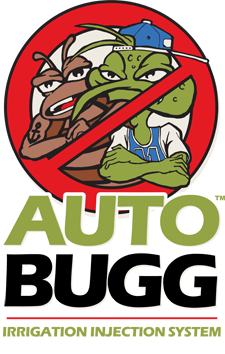 Ask us about AutoBuggTM! To arrange for a free, no-obligation quote from Factor Irrigation, click here or call (401) 828-1116 today!